“My name is Sophia and I am 18, I am a Full-Time Volunteer on a Student Choices project in Sheffield where I support a young man with a disability to study at university and to live independently. I am from Germany and before I came to the UK I was studying Maths, German, Religion, Spanish and French to advanced level, I also studied Latin for 5 years. I made the decision to volunteer following a recommendation from a friend who had volunteered in the UK last year, and I’m very glad I did as it’s been the most amazing experience! Living in a new country and meeting new challenges, it’s really helped to increase my skills and knowledge, especially my self-confidence and my sense of independence as it’s the first time that I’ve lived away from my parents. I had three main goals that I hoped to achieve through volunteering and I can honestly say I have achieved them all. They were to be successful in the role, to feel supported, and confirm my career aspirations – and also to enjoy the opportunity! I definitely feel that I’ve developed a good relationship with the person I am supporting. He’s also had a successful year and recently passed all of his University exams. 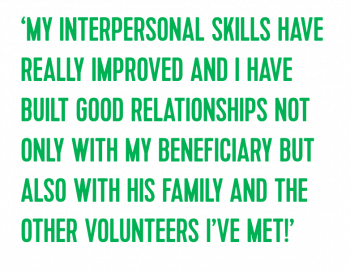 My interpersonal skills have really improved and I have built good relationships not only with my beneficiary but also with his family and the other volunteers I’ve met. In Germany I completed a comprehensive training programme before coming to the UK, and I received lots of information from Volunteering Matters so I felt very prepared. During the placement I have always felt supported both by my beneficiary’s family, my supervisor and my Volunteer Manager, who I felt was always there for me. My placement comes to an end soon and I will be returning to Germany. This year has really helped me to focus on what I want for my future. I’ve always known that I wanted to work with people and prior to volunteering I wanted a career in Social Work, but now I have decided to become a tutor for children at primary level. On my return to Germany I intend to resume my studies and work toward my career goals. On a social level I’ve enjoyed new experiences. At home I dance in a Rock n Roll band – I have done for 10 years. I missed dancing here, so I’ve taken up Zumba, and I’m loving it!